Probably the best known and most admired open dayboat. The Lugger typifies our range. Our craftsmanship finish with bronze fittings and beautiful hardwood trim places this boat in a class of it’s own. The Lugger is a 5.72m (18ft 9″) Trailer Sailer. Easy to launch and sail, especially with our own roller coaster trailer solo or fully crewed. The loose footed sails and sliding gunter rig are easy to handle – there’s no boom to look out for! It’s a dayboat which you can convert with a sprayhood- it’s a sailing boat, a rowing boat, or with recommended 4-6hp outboard motor, a very manoeuvrable run about. For a full specification plan please click HERE. For pricing and options click HERE or click on the picture in the bottom of the left hand column. This boat was originally called the Drascombe Lugger and then re named Original Devon Lugger. 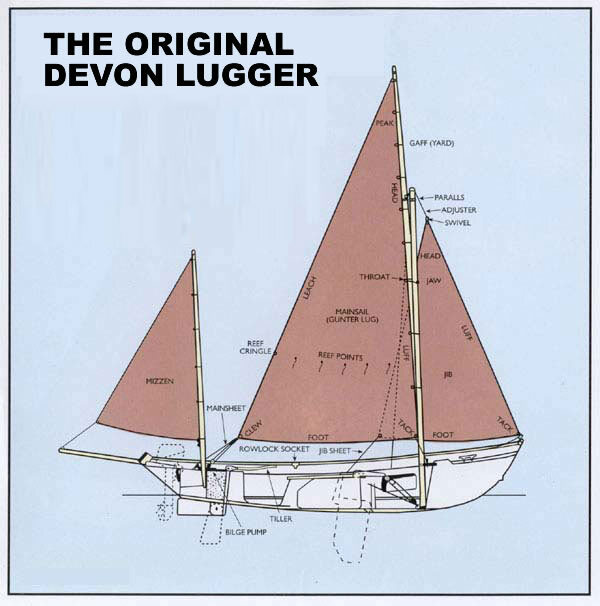 The Lugger also has the European recreational craft directive, and carries up to seven people safely. She can be found adventure sailing on open coast, quiet fishing trips, or exploring inlets and backwaters.